This article discusses the epidemiology, clinicopathological and imaging features, diagnosis, treatment, and prognosis of adamantinoma of the long bones. Adamantinoma of the long bones is a rare tumor that accounts for 0.3%-1% of all malignant bone tumors.4-9,21 In 1986, Moon and Mori2 performed a meta-analysis of 200 cases. In 1996, Unni18 reported 36 cases in an analysis of 5641 primary malignant bone tumors from a single institution. Figure 1: AP (A) and lateral (B) plain radiographs show an expansile mixed lytic and sclerotic lesion of the mid-portion of the right tibia. Technetium pyrophosphate bone scan shows intense increased uptake tracer accumulation, corresponding closely to the extent of the lesion.18,21,36 In addition, bone scan may show a coexisting fibular involvement. Computed tomography reveals an osteolytic lesion with expansion and destruction of the cortex (Figure 2), and probable extension to the surrounding soft tissues.21,37 Magnetic resonance imaging (MRI) is useful in providing information concerning the intramedullary and soft-tissue extent of the tumor.9,20,36-38 On T1-weighted MRI, the lesion has a low intensity signal, whereas on T2-weighted MRI the signal is much brighter and does not diminish with the fat suppression technique. Figure 2: CT scan of the right leg shows a lytic expansile lesion within the tibia. There is intramedullary involvement with some calcifications and thinning of the cortex, particularly posteriorly. Figure 3: Histological appearance of adamantinoma. Low-power view (A) shows islands of epithelial cells surrounded by fibrous tissue and high-power view (B) of the cluster of epithelial cells within the fibrous stroma. Because of its rarity and differing histological patterns, adamantinoma histologically may resemble epithelial metastasis, hemangioendothelioma, hemangiosarcoma, fibrous and osteofibrous dysplasia, nonossifying fibromas, and chondromyxoid fibromas.18,19,44-47 Clinical information such as patient age and history, as well as the location in the tibial diaphysis, may aid in diagnosis. Figure 4: AP (A) and lateral (B) plain radiographs after wide resection of the tumor and reconstruction using a 13 cm intercalary tibial allograft fixed using a DCP plate and screws and autologous iliac bone grafting at the host bone allograft junction. Adamantinoma of the long bones is a rare, primary, low-grade, slow-growing malignant bone tumor. It is expressed with a wide range of histological patterns. 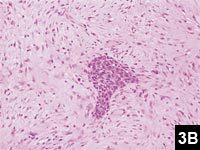 Histologically, the tumor is composed of an epithelial component surrounded by a fibrous stroma that may or may not contain spicules of woven bone. In the majority of cases, adamantinomas are located in the tibial diaphysis. Limb salvage with wide surgical resection and reconstruction or amputation is the most effective treatment. Local recurrence is associated with incomplete resection. Survival rates range from 82% to 87%. Late metastases, mainly to the lungs, may occur. Hauben E, van den Broek LC, Van Marck E, Hogendoorn PC. Adamantinoma-like Ewings sarcoma and Ewings-like adamantinoma. The t(11; 22), t(21; 22) status. J Pathol . 2001; 195:218-221. Moon NF, Mori H. Adamantinoma of the appendicular skeletonupdated. Clin Orthop Relat Res . 1986; 204:215-237. Schajowicz F, Ackerman LV, Sissons HA. Histological Typing of Bone Tumors. International Histological Classification of Tumors No. 6. , Geneva, Switzerland: World Health Organization; 1972. Unni KK, Dahlin DC, Beabout JW, Ivins JC. Adamantinomas of long bones. Cancer . 1974; 34:1796-1805. Huvos AG, Marcove RC. Adamantinoma of long bones. A clinicopathological study of fourteen cases with vascular origin suggested. J Bone Joint Surg Am . 1975; 57:148-154. Czerniak B, Rojas-Corona RR, Dorfman HD. Morphologic diversity of long bone adamantinoma. The concept of differentiated (regressing) adamantinoma and its relationship to osteofibrous dysplasia. Cancer . 1989; 64:2319-2334. Campanacci M. Adamantinoma of the long bones. In: Bone and Soft Tissue Tumors . New York, NY: Springer; 1990:629-638. Hazelbag HM, Taminiau AHM, Fleuren GJ, Hogendoorn PC. Adamantinoma of the long bones. A clinicopathological study of thirty-two patients with emphasis on histological subtype, precursor lesion, and biological behavior. J Bone Joint Surg Am . 1994; 76:1482-1499. Rosai J, Pinkus GS. Immunohistochemical demonstration of epithelial differentiation in adamantinoma of the tibia. Am J Surg Pathol . 1982; 6:427-434. Hazelbag HM, Fleuren GJ, van den Broek LJ, Taminiau AH, Hogendoorn PC. Adamantinoma of the long bones: keratin subclass immunoreactivity pattern with reference to its histogenesis. Am J Surg Pathol . 1993; 17:1225-1233. Keeney GL, Unni KK, Beabout JW, Pritchard DJ. Adamantinoma of long bones. A clinicopathologic study of 85 cases. Cancer . 1989; 64:730-737. Knapp RH, Wick MR, Scheithauer BW, Unni KK. Adamantinoma of bone. An electron microscopic and immunohistochemical study. Virchows Archive. A, Pathological Anatomy and Histopathology . 1982; 398:75-86. Mori H, Yamamoto S, Hiramatsu K, Miura T, Moon NF. Adamantinoma of the tibia. Ultrastructural and immunohistochemic study with reference to histogenesis. Clin Orthop Relat Res . 1984; 190:299-310. Elliott GB. Malignant angioblastoma of long bone. So-called tibial adamantinoma. J Bone Joint Surg Br . 1962; 44:25-33. Llombart-Bosch A, Ortuno-Pacheco G. Ultrastructural findings supporting the angioblastic nature of the so-called adamantinoma of the tibia. Histopathology . 1978; 2:189-200. Lederer H, Sinclair AJ. Malignant synovioma simulating adamantinoma of the tibia. J Pathol Bacteriol . 1954; 67:163-168. Unni KK. 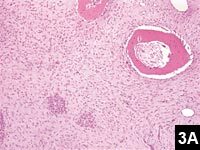 Dahlins Bone Tumors: General Aspects and Data on 11,087 Cases . 5th ed. Philadelphia, Pa: Lippincott-Raven; 1996:333-342. Dorfman HD, Czerniak B. Bone Tumors . St Louis, Mo: Mosby; 1998:949-973. Kahn LB. Adamantinoma, osteofibrous dysplasia, and differentiated adamantinoma. Skeletal Radiol . 2003; 32:245-258. Filippou DK, Papadopoulos V, Kiparidou E, Demertzis NT. Adamantinoma of tibia: a case of late local recurrence along with lung metastases. J Postgrad Med . 2003; 49:75-77.
van Rijn R, Bras J, Schaap G, van den Berg H, Maas M. Adamantinoma in childhood: report of six cases and review of the literature. Pediatr Radiol . 2006; 36:1068-1074. Kumar D, Mulligan ME, Levine AM, Dorfman HD. Classic adamantinoma in a 3-year-old. Skeletal Radiol . 1998; 27:406-409. Soucacos PN, Hartofilakidis GK, Touliatos AS, Theodorou V. Adamantinoma of the olecranon. A report of a case with serial metastasizing lesions. Clin Orthop Relat Res . 1995; 310:194-199.
van Haelst UJ, de Haas van Dorsser AH. A perplexing malignant bone tumor. Highly malignant so-called adamantinoma or non-typical Ewings sarcoma. Virchows Archive. A, Pathological Anatomy and Histopathology . 1975; 365:63-74. Beppu H, Yamaguchi H, Yoshimura N, Atarashi K, Tsukimoto K, Nagashima Y. Adamantinoma of the rib metastasizing to the liver. Intern Med . 1994; 33:441-445. 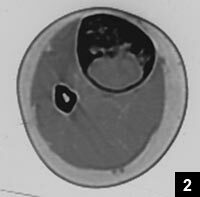 Bourne MH, Wood MB, Shives TC: Adamantinoma of the radius: a case report. Orthopedics . 1988; 11:1565-1566. Dimi LI, Mendonca R, Adamy CA, Saraiva GA. Adamantinoma of the spine: case report. Neurosurgery . 2006; S9:E426. Clarke RP, Leonard JR, von Kuster L, Wesseler TA. Adamantinoma of the humerus with early metastases and death: a case report with autopsy findings. Orthopedics . 1989; 12:1121-1125. Mohler DG, Cunningham DC. Adamantinoma arising in the distal fibula treated with distal fibulectomy: a case report and review of the literature. Foot Ankle Int . 1997; 18:746-751. Henneking K, Rehm KE, Schulz A. Adamantinoma of the long tubular bones. Case report of a fibular tumor. Chirurg . 1984 ; 55:407-410. Van Schoor JX, Vallaeys JH, Joos GF, Roels HJ, Pauwels RA, Van Der Straeten ME. Adamantinoma of the tibia with pulmonary metastases and hypercalcemia. Chest . 1991; 100:279-281. Enneking WF. The staging system for benign and malignant tumors of muskoloskeletal system (Appendix A). In: Clinical Muskoloskeletal Pathology . Gainesville, Fla: University Press of Florida; 1990:451-466. Plump D, Haponik EF, Katz RS, Tipton-Donovan A. Primary adamantinoma of rib: thoracic manifestations of a rare bone tumor. South Med J . 1986; 79:352-355. Altmannsberger M, Poppe H, Schauer A. An unusual case of adamantinoma of long bones. J Cancer Res Clin Oncol . 1982; 104:315-320. Brain EC, Raymond E, Goldwasser F, Extra JM, Marty M. Adamantinoma of the proximal end of the tibia. A case. Presse Med . 1994; 23:1522-1526. Garces P, Romano CC, Vellet AD, Alakija P, Schachar NS. Adamantinoma of the tibia: plain-film, computed tomography and magnetic resonance imaging appearance. Can Assoc Radiol J . 1994; 45:314-317. Van der Woude HJ, Hazelbag HM, Bloem JL, Taminiau AH, Hogendoorn PC. MRI of adamantinoma of long bones in correlation with histopathology. AJR Am J Roentgenol . 2004; 183:1737-1744. Johnson LC. Congenital pseudoarthrosis, adamantinoma of long bone, and intracortical fibrous dysplasia of the tibia. J Bone Joint Surg Am . 1972; 54:1355. Hazelbag HM, Fleuren GJ, Cornelisse CJ, van den Broek LJ, Taminiau AH, Hogendoorn PC. DNA aberrations in the epithelial cell component of adamantinoma of long bones. Am J Pathol . 1995; 147:1770-1779. Jundt G, Remberger K, Roessner A, Schulz A, Bohndorf K. Adamantinoma of long bones. A histopathological and immunohistochemical study of 23 cases. Pathol Res Pract . 1995; 191:112-120. Bovee JV, van den Broek LJ, de Boer WI, Hogendoorn PC. Expression of growth factors and their receptors in adamantinoma of long bones and the implication for its histogenesis. J Pathol . 1998; 184:24-30. Kanamori M, Antonescu CR, Scott M, et al. Extra copies of chromosomes 7, 8, 12, 19, and 21 are recurrent in adamantinoma. J Mol Diagn . 2001; 3:16-21. Hazelbag HM, Wessels JW, Mollevangers P, van den Berg E, Molenaar WM, Hogendoorn PC. Cytogenetic analysis of adamantinoma of long bones: further indications for a common histogenesis with osteofibrous dysplasia. Cancer Genet Cytogenet . 1997; 97:5-11. Campanacci M, Laus M. Osteofibrous dysplasia of the tibia and fibula. J Bone Joint Surg Am . 1981; 63:367-75. Benassi MS, Campanacci L, Gamberi G, et al. Cytokeratin expression and distribution in adamantinoma of the long bones and osteofibrous dysplasia of tibia and fibula. An immunohistochemical study correlated to histogenesis. Histopathology . 1994; 25:71-76. Campanacci M. Bone and Soft Tissue Tumors: Clinical Features, Imaging, Pathology and Treatment. Wien, Austria: Springer; 1999. Lokich J. Metastatic adamantinoma of bone to lung? A case report of the natural history and the use of chemotherapy and radiation therapy. Am J Clin Oncol . 1994; 17:157-159. Weiss SW, Dorfman HD. Adamantinoma of long bones. An analysis of nine new cases with emphasis on metastasizing lesions and fibrous dysplasia-like changes. Human Pathol . 1977; 8:141-153. Campanacci M, Giunti A, Bertoni F, Laus M, Gitelis S. Adamantinoma of the long bones: The experience at the Instituto Ortopedico Rizzoli. Am J Surg Pathol . 1981; 5:533-542. Gebhardt MC, Lord FC, Rosenberg AE, Mankin HJ. The treatment of adamantinoma of the tibia by wide resection and allograft bone transplantation. J Bone Joint Surg Am . 1987; 69:1177-1188. Rock MG, Beabout JW, Unni KK, Sim FH. Adamantinoma. Orthopedics . 1983; 6:472. Wang JW, Shih CH, Hsu WW, Chen WJ. Treatment of recurrent adamantinoma of the tibia by wide resection: report of three cases. J Formos Med Assoc . 1993; 92:274-277. Taylor GI. The current status of free vascularized bone grafts. Clin Plast Surg . 1983; 10:185-209. Weiland AJ, Moore JR, Daniel RK. Vascularized bone autografts. Experience with 41 cases. Clin Orthop Relat Res . 1983; 174:87-95. Szendroi M, Renyi-Vamos A, Marschalko P, Minik K, Kiss AL. Behavior of adamantinoma of the long bones based on long-term follow up studies. Magyar Traumatologia Ortopedia Kezsebeszet Plasztikai Sebeszet . 1994; 37:37-44. De Keyser F, Vansteenkiste J, Van Den Brande P, Demedts M, Van de Woestijne KP. Pulmonary metastases of a tibia adamantinoma. Case report and review of the literature. Acta Clin Belg . 1990; 45:31-33. Drs Papagelopoulos and Mavrogenis are from the First Department of Orthopedic Surgery, Athens University Medical School, Athens, Greece, Dr Galanis is from the Division of Medical Oncology, Mayo College of Medicine, Rochester, Minn, Dr Savvidou is from the Department of Orthopedics, Thriasion General Hospital, Elefsis, Hellas-Greece, Ms Inwards is from the Division of Anatomic Pathology, Mayo College of Medicine, Rochester, Minn, and Dr Sim is from the Department of Orthopedic Surgery, Mayo College of Medicine, Rochester, Minn.
Drs Papagelopoulos, Mavrogenis, Galanis, Savvidou, and Sim and Ms Inwards have no industry relationship to declare. The material presented at or in any Vindico Medical Education continuing education activity does not necessarily reflect the views and opinions of Vindico Medical Education or Orthopedics. Neither Vindico Medical Education or Orthopedics , nor the faculty endorse or recommend any techniques, commercial products, or manufacturers. The faculty/authors may discuss the use of materials and/or products that have not yet been approved by the US Food and Drug Administration. All readers and continuing education participants should verify all information before treating patients or utilizing any product. Correspondence should be addressed to: Panayiotis J. Papagelopoulos, MD, DSc, Athens University Medical School, 4 Christovassili Street, Neo Psychikon, 15451, Athens, Greece.